If so, there is actually a company that can actualize this for you! It is done by a company that goes by the name “Creative Home Engineering” which was started back in 2003 by a few friends who happened to be engineers. Here is one of their Youtube videos which has been viewed over 4 million times and Here is a more recent video done by Bloomberg talking about the services that they offer. You can also take a look at there website where they have image galleries and more here! Many of the projects are customized. 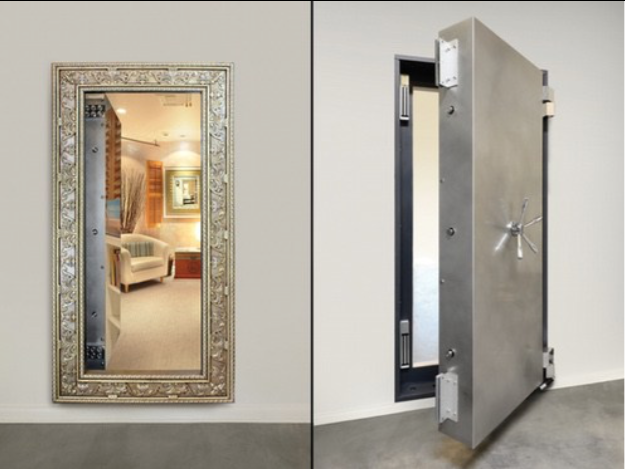 However we are in the process of developing ever more standardized secret passageways where we can partner with home builders, developers and agents to be able to provide a specific line item for a secret passageway within their home customization options. While there are many beautiful things that go into a luxury home, residences that have included one of our secret doors have often received tremendous amount of press when it came to listing the home for sale. This image reminds me of the secret room from the movie “Panic Room” in which Jodie Foster hides with her daughter from burglars,. I might have to re-watch the movie because I have a newfound appreciation for hidden rooms! What do you think about hidden rooms like these?